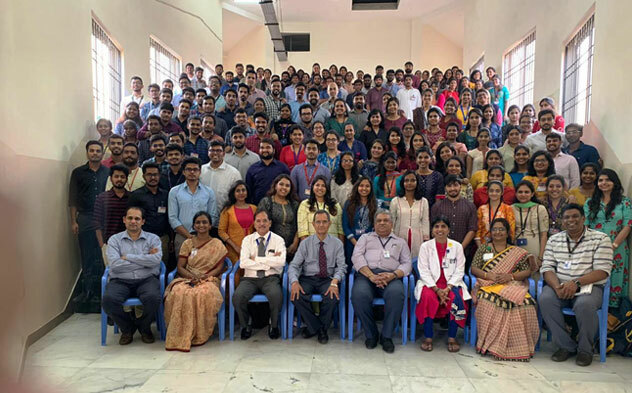 As customary in SRMC ,the students council members of MBBS, organised a small get together for the interns,who graduated in 2019 on 10th January 2019.The events started at 4 pm wherein the C.R.RIs ,along with college dignitaries had taken a class group photo. After the photoshoot, the new M.B.B.S. graduates were met by their juniors , who had put on an entertaining show, with potrayals of their dancing and singing skills.These students are part of the music and dance clubs of SRIHER. The events took place in the seminar hall of the college building and was graced by the presence of Dr P.V. Vijayaraghavan, Vice Chancellor,Dr. Anandan,Dean of the Medical College,Dr K. Balaji Singh,Dean of Students, Dr. Usha V,Interns Incharge, , Dr Leena Dennis Joseph, Dr Pankaj Shah , Dr Naveen Alexander,three assistant deans and Dr Pavithra, Vice President of the alumni cell. All the aforementioned dignitaries addressed the students,about many aspects, which carried in them a lot of wisdom and memories of their Internship. After the speeches and performances ,there were extempore performances done by the graduates. This was followed by cake cutting and then the graduates dispersed,with the commitment to stay connected to their alma mater,through the alumni association. This entry was posted in Student Events by University. Bookmark the permalink.